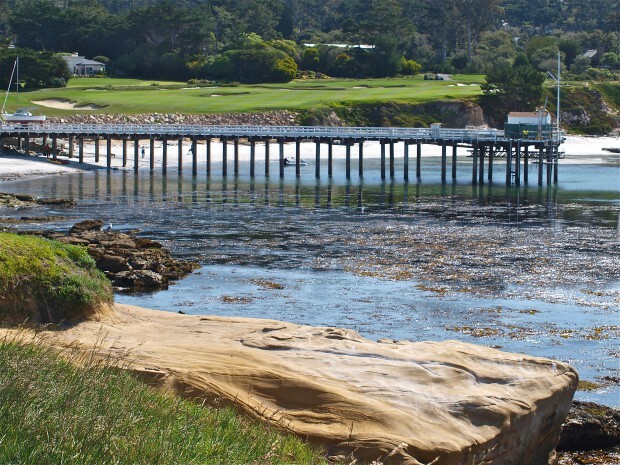 After watching the last round of today’s Pebble Beach Pro-Am, I thought what better day to post some facts about the pier that kept showing up on the screen? The view from the pier is stunning! 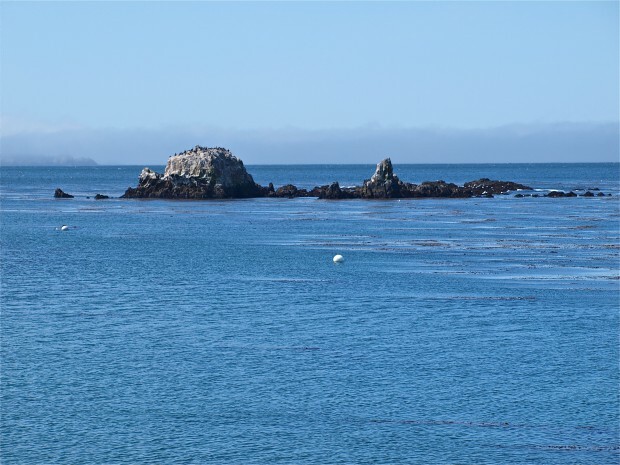 Look slightly to the west and you’ll see the Pescadero Rocks, the rocky pinnacle and strands of kelp that give shelter to this cove and truly provide, on most days, water that seems almost motionless. 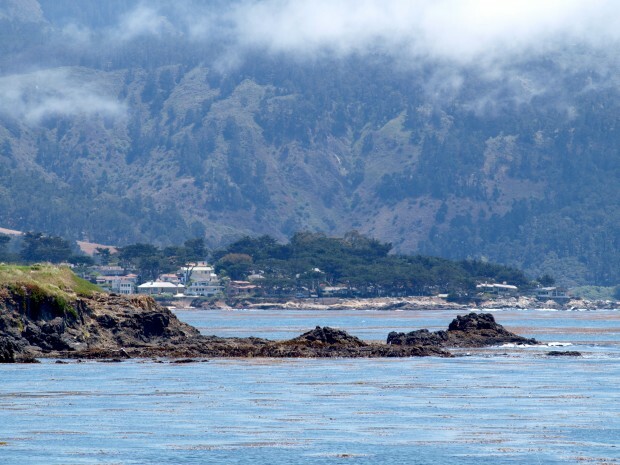 Look to your right and you’ll see Pescadero Point and the large pink structure known as the “Castle House,” perhaps the most famous—and expensive—house in Pebble Beach (and site of several movies). 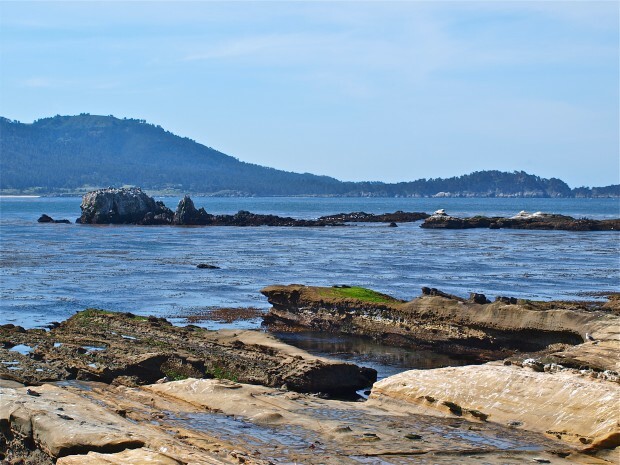 Look to your left and you’ll glimpse Arrowhead Point and mystical Carmel; shift your attention just a little to the right and you’ll see Point Lobos and the beginnings of the Big Sur coastline, one of the world’s most scenic areas. 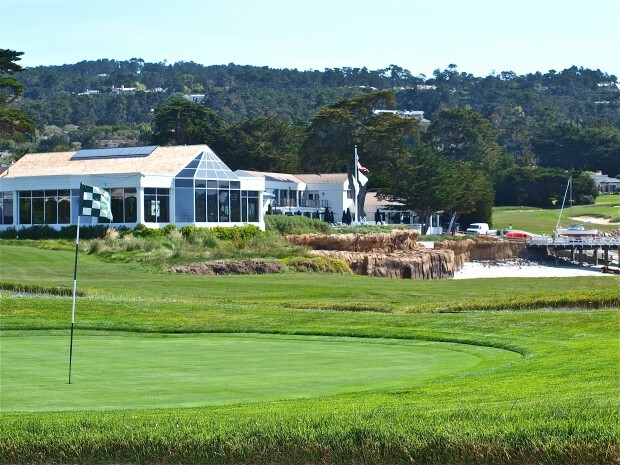 Turn around (do a whirling dervish) and look inshore and you’re confronted with an attractive beach, the exclusive Beach and Tennis Club, and one of the world’s more famous and beautiful golf courses—the Pebble Beach Golf Course. 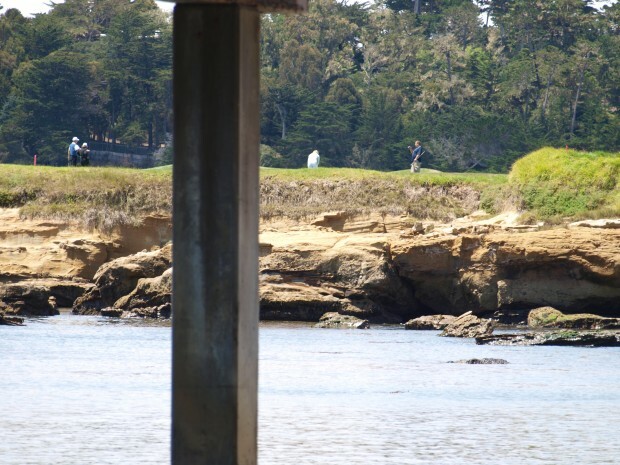 In fact, the 4th hole sits next to the shoreline by the pier and holes 5-7 effectively circle the cove. The 17th hole sits just the other side of the Beach and Tennis Club. It’s kind of interesting—when the fishing is slow—to keep an eye on the golfers to see how they’re doing. And, you never know who might be on the links; it’s home to the rich and famous. However, I’ve often thought that perhaps it’s just a tad too pretty a postcard setting to also be a good fishing pier and my results have tended to confirm that thought. On most days you’ll have the pier to yourself, at least as far as fishing. There is a boat hoist on the pier, and a limited number of divers are allowed to depart from the pier (10 a day), but I’ve never seen more than a couple of anglers on the pier. In fact, you’ll usually have the pier to yourself; about the only regulars are workers from the nearby club. Environment. 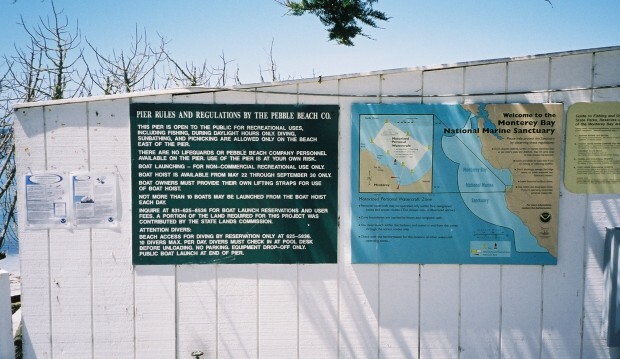 Although part of the Carmel Bay Ecological Reserve, sport fishing for fin fish is allowed as a sign at the front of the pier points out. The water here is shallow and, as mentioned, generally very calm due to Pescadero Point and the Pescadero Rocks, the outcropping of rocks that sit somewhat south of the Point and help protect the area from northwest swells. Although fish-enticing rocks define much of the cove’s bottom, and line the shoreline area on one side of the cove, they’re just a little too far away from the pier to give it a rocky environment. Instead, the bottom surrounding the pier itself is mostly sand that transitions into rock rubble as you get into deeper water. 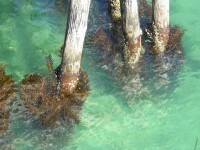 The pier pilings are concrete, with very little fish attracting growth on them, while heavy masses of seaweed and kelp are spread from the pier throughout the cove; giant kelp in the deeper waters, feather boa kelp in the shallows. 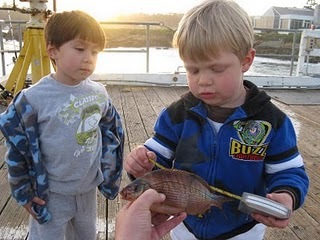 Due to the shallow-water, sandy-bottom environment around the pier, and a general lack of water movement, what looks so promising at first glance often leads to disappointment when measured strictly in terms of fish. Perhaps it’s better just to enjoy the setting and let the fishing be secondary in nature. 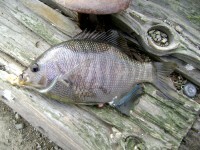 Somewhat surprisingly, two rocky-habitat species—blackperch and striped seaperch, seem to be the most common fish taken from the pier. In addition a few rockfish do show up, as well as a few cabezon and lingcod. Mostly though these hang around the nearby kelp and reefs rather than being residents of the pier area. 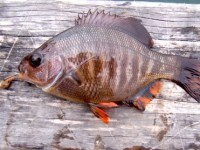 As for the sandy shore species, a few are taken—barred, calico, walleye, spotfin and silver surfperch, but their numbers seem limited. Common, at times, are jacksmelt and when a school heads by the rocks it can provide some steady action. 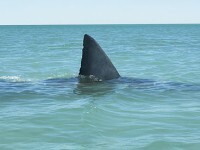 In addition, the mix may also see a few more solitary species, flatfish, as well as a few leopard sharks and bat rays. A non-fish species that does seem to be resident is harbor seals, I’ve rarely had a visit when at least a few of the pinnipeds weren‘t bobbing around in the water. Sea otters may also make an appearance and when they do they can be quite amusing. Make sure you enjoy the scenery because most days, as said, are not that great as far as fishing. Better fishing can be found from nearby shoreline areas, especially Arrowhead Point, but much of the area is restricted. Fishing Tips. Primary species are the aforementioned perch—black and striped—joined by lesser numbers of rubberlip and rainbow seaperch, all probably having wandered over from the nearby rocks. 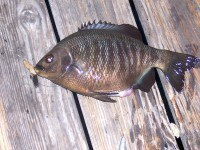 They will be joined by barred surfperch, calico surfperch and walleye surfperch, species that prefer the sandy bottom around the pier. Joining them will be flatfish such as sand sole, starry flounder, sanddabs and perhaps a halibut (but you need the right bait or lures). 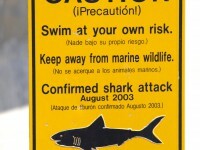 A few leopard sharks are reported from the pier and a few rays. Add in some small to medium-size rockfish (mostly grass rockfish), a stray cabezon or two, and an occasional lingcod, and you have a decent variety. Just don’t expect a lot of fish every day. As for the perch, stick to the basics—pile worms, fresh mussels, ghost shrimp, or small pieces of market shrimp (all of which you will have to bring with you). For the barred surfperch you can try the sandy-shore area and try sand crabs (if you can find them), fresh mussels, pile worms or ghost shrimp. Like many areas, anglers are also beginning to use plastics—a variety of grubs and swim baits—for the perch. The aforementioned baits will also attract the small to medium-size rockfish (that are often called rock bass by the locals). However, strips of squid can also be effective and may lure in a sole or shark. 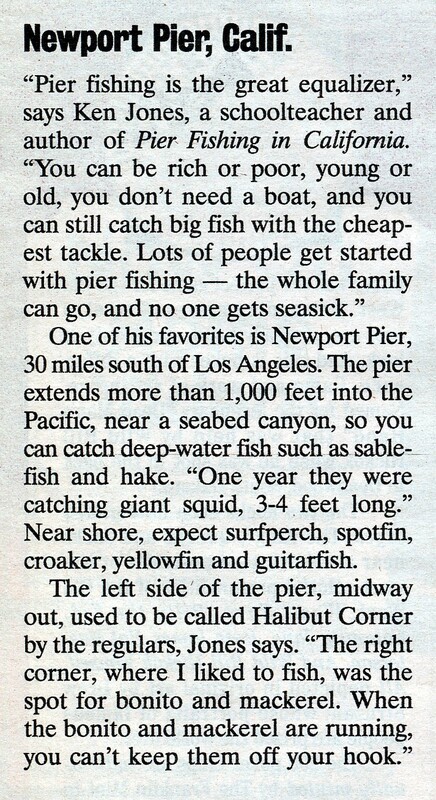 If seeking out the rockfish, cabezon, and lingcod, I suggest following the words of MB, a local who fishes the pier fairly often. 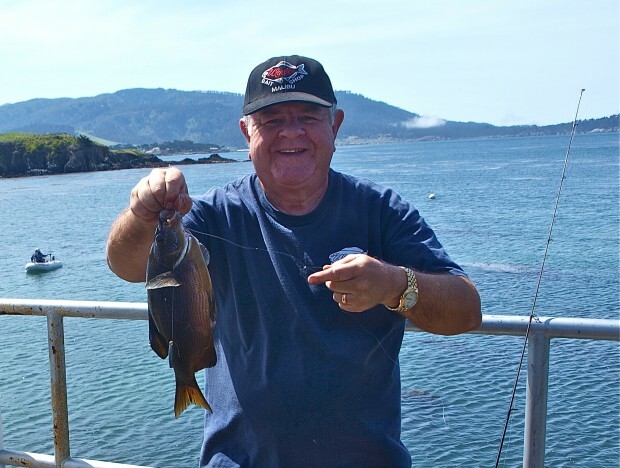 His advice: “casting toward the 17th hole is where the rocky bottom and kelp bed begins to grow and where I catch all of my rockfish/cabezon from the pier (but you have to cast far and be prepared with heavy gear for snags). Even though there are pockets of kelp throughout, only perch seem to inhabit those areas.” As I always say, follow the advice of the locals. Do be prepared for some snags because you’ll probably get them. No pain no gain, right? Some large leopard sharks and bat rays are also found in these waters so be sure to bring along a net. 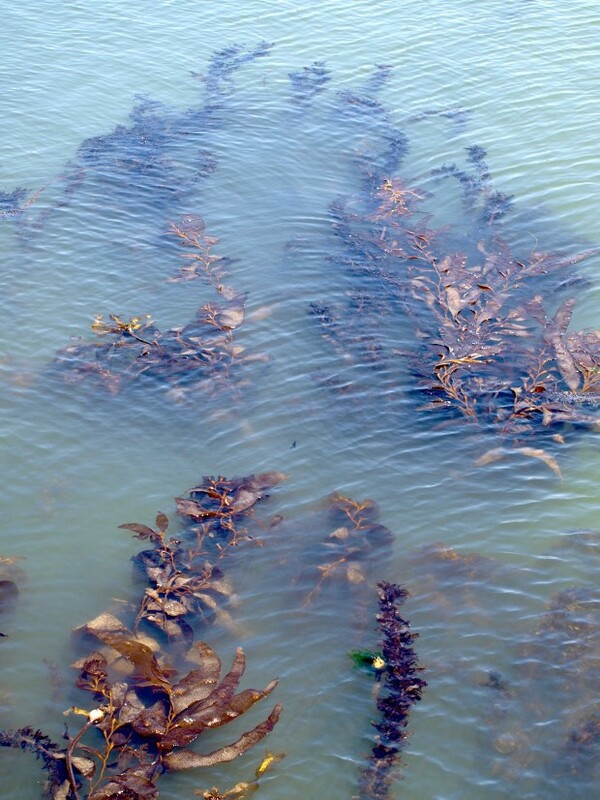 Problem here is keeping the bigger creatures from encircling bits of kelp with the line. As always, a bit of luck is needed if you hook a big fish. 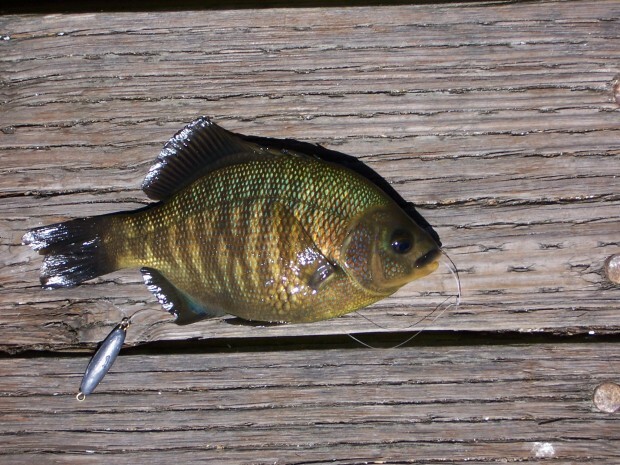 However, the pier is small and if necessary a fish can often be walked down to the sandy beach at the front of the pier or to the dock that is tethered to the end of the pier during the summer. Note No. 2. Stillwater Cove and the nearby Coast Guard Pier in Monterey are the only two sites in California where sea otters have been observed attacking and eating birds (it’s also been observed in Alaska). Species attacked included western grebes, cormorants, surf scooters, common loons, and gulls. Otters have been observed approaching birds from under the water as the birds rested on the surface, then dragging the birds underwater while wrestling with them and biting them. Attacks lasted up to fifteen minutes before the bird was eaten. At the same time female otters have been observed carrying around a bird carcass on their chest for an hour or more. Scientists aren’t quite sure what to make of the phenomenon. Note No. 3. Although the cove and setting have a rather “pristine” feel to them, looks can be deceiving. Heal the Bay, a Santa Monica-based group that monitors water quality at 370 locations along the coast, rated Stillwater Cove as one of the three dirtiest beaches (“Beach Bummers”) in Northern California along with Campbell Cove State Beach in Sonoma County and Pillar Point Harbor in Half Moon Bay. At least that was the finding in 2005. The good news is that Stillwater Cove received “A’s” on the 2008 and 2009 report cards given by Heal the Bay so evidently things are improving. Note No. 4. Like many of California’s piers and their beaches, this cove and pier was used in a movie—Captain January (1936). 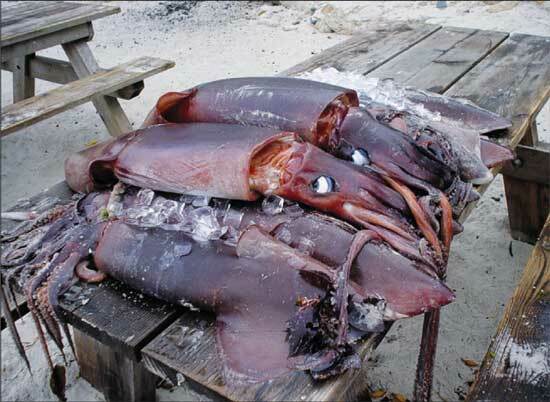 WHILE NOT quite of the gargantuan proportions of Jules Verne’s famous giant squid, a group of Humboldt squid that washed ashore at Stillwater Cove in Pebble Beach last week were certainly mysterious and fascinating — and huge. When Joey Guilatco arrived for work at the Beach and Tennis Club at 5 Friday morning, he was told that a club member walking her dog had found several squid stranded on the nearby beach. With a flashlight, Guilatco went down to the beach and searched in the early morning darkness. And while almost everyone else was still peacefully dreaming in bed, he came across a sight that did not seem to belong to the waking world — more than a dozen of the largest squid he’d ever seen, many still alive, scattered along the beach. They were “moving, breathing, and spewing some kind of saliva,” Guilatco said. It was their size that struck him most. Including their tentacles, some were five feet long. They weighed about 10 pounds each, which Guilatco learned as he and other P.B. employees tried to lug the living animals back to the ocean. He called the Moss Landing Marine Laboratory to report the incident and see if the experts could explain the bizarre event. They instructed Guilatco to preserve the dead ones in ice while they considered sending a scientist to investigate. Guilatco and the other employees collected the squid and put them on a bed of ice on a picnic table at the beach. Souvenirs? The Moss Landing people never came, but the squid did not go to waste. By the end of the day, all but one had been taken. History Note. It’s a little hard to imagine today but the cove and its shoreline once served as home for a Chinese fishing village. 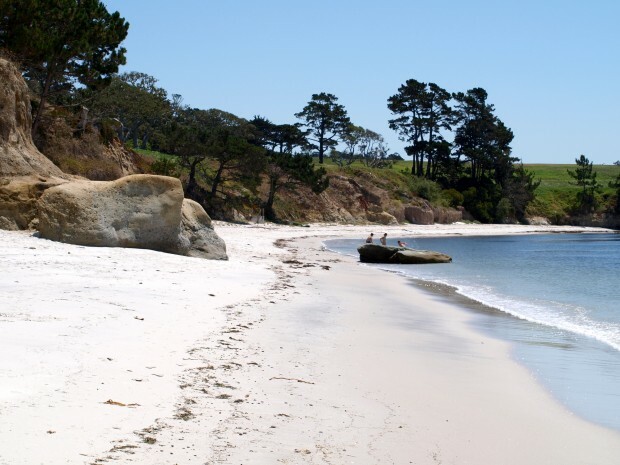 The Chinese had fished Carmel Bay since 1851 when they set up a camp in Point Lobos; soon after two additional camps were established, one at Pescadero (today’s Stillwater Cove), and one at Point Alones (near Cannery Row). 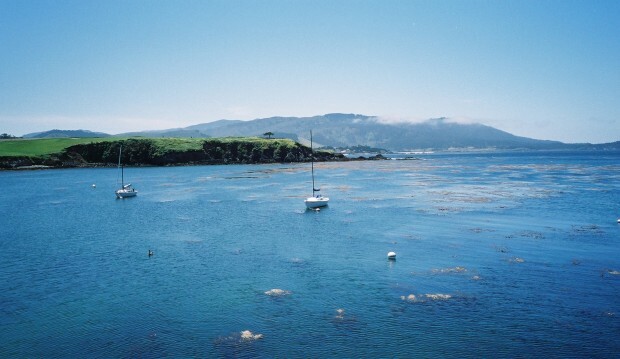 By 1853 a settlement was recorded at Cabrillo Point (China Point), the site of today’s Hopkins Marine Station. It would be the main Chinese settlement for many years. The Chinese were skillful fisherman and a large part of the Monterey fishing industry for many years but eventually they came into conflict with other immigrant groups, especially the Italian-American fishermen. 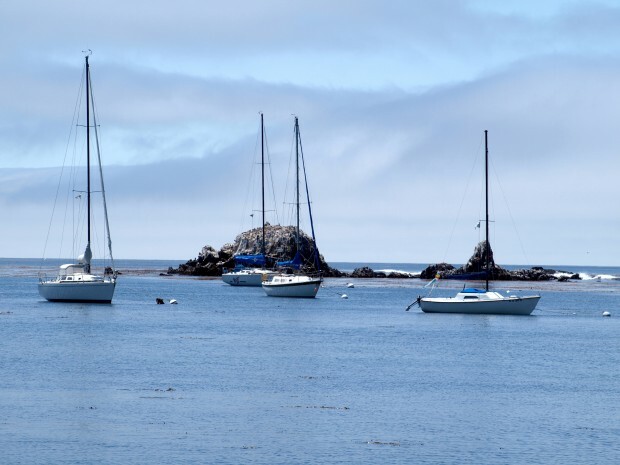 Increasingly restrictive laws made it hard to fish and process their catch, and when combined with a mysterious fire at the China Point settlement in 1906, the decline of the “Chinese fishing villages” almost seemed inevitable. The Pescadero camp itself apparently came to an end in 1912. 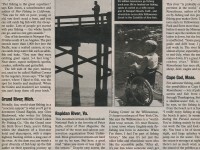 In 1916 the Monterey Cypress newspaper reported plans for a pier and bathhouse at the cove. Just a few years later, in 1919, the small fishing lodge had grown to be “one of the finest fishing clubs in the country.” That lodge was the forerunner for today’s Beach & Tennis Club building that sits near the front of the pier. Not mentioned is the fact that Matthew Jenkins was also one of the developers of Pebble Beach and that the Jenkin’s had bought the 5.5 acre parcel overlooking Stillwater Cove in 1943 for $43,000. Their purchase, and refusal to sell it to Samuel Morse who developed Pebble Beach Golf Links, prevented his plan for a shoreline hole No. 5. The building of the shoreline hole would not take place until 1999 when the heirs to Mimi Jenkins sold her property. As happens to all coastal piers, the sea and weather take a toll. 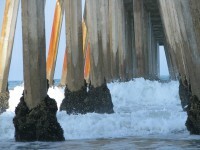 Sooner or later wood (especially the pilings) deteriorates and repair or a rebuild is necessary. In this case, the pier was condemned in 1980. Another new pier was needed but the story of the new pier would take several interesting twists before completion. In 1977 the Del Monte Properties Company had reincorporated as Pebble Beach Corporation and then, in 1979, the company was bought by Marvin Davis who owned Twentieth Century Fox. It was during his tenure as owner that The Inn & Links at Spanish Bay was developed (in part, as rumor has it, to increase needed cash flow). Davis needed the approval of the Coastal Commission to build the new resort and they were agreeable with a number of conditions, one being that “Public Access” be gained for Stillwater Cove. However, the property at the cove was owned by Mimi Jenkins (following the death of Matthew her husband). As matriarch of her family, and still involved with the yacht club, she was agreeable to the public access with several additional conditions that she had her attorney add to the mix. 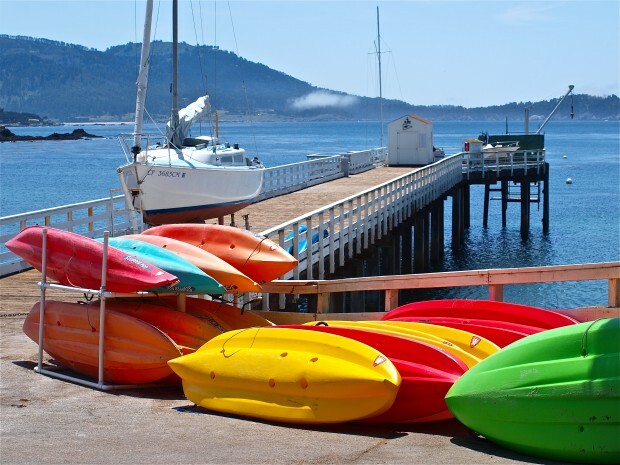 The Pebble Beach Corporation company would build a new pier and put a hoist on the pier. In addition, they would have a Harbor Master on duty part of the year (May 15-September 15). 50 visitors would be allowed to visit the cove (and pier) per day but no more than 10 divers a day and they would no longer be allowed to shoot fish under water, only observe and/or photograph them. 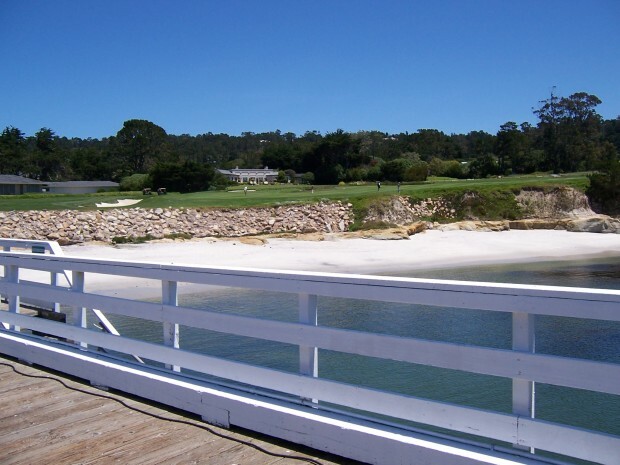 The cove and pier would remain open to all residents of Pebble Beach. 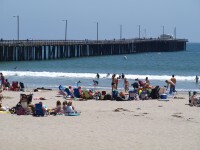 The corporation and the coastal commission agreed to the conditions and a new pier was constructed (for a relatively modest $500,000). 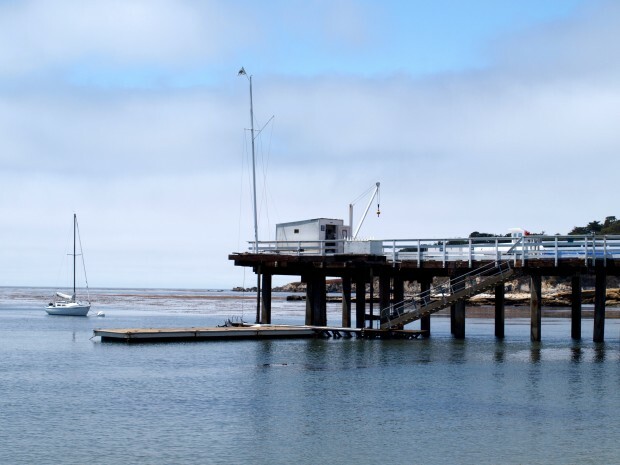 The Pebble Beach Corporation would go through further change and ownership, but the pier with its special conditions has remained relatively unchanged since 1984 (although a new hoist is planned for the pier). 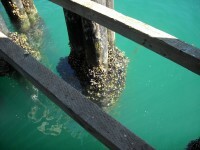 Facilities: Few, since this pier was not designed as a fishing pier. There is a limited amount of coastal access parking near the entrance to the club‘s parking lot. Look for the tall hedge and you’ll see (ten spaces) that are gone quickly given the number of divers who visit the area. Always call 831-625-8536 to reserve a space if you intend to visit. Restrooms are found near the front of the pier. Handicapped Facilities: Handicapped parking (one space) but non-handicapped restrooms. The pier surface is wood planking with a rail height of 43 inches; an 8-inch curb runs along the entire length of the pier making access to the railing difficult. Not posted for handicapped. How To Get There: From Highway 1 take the Pebble Beach Exit. 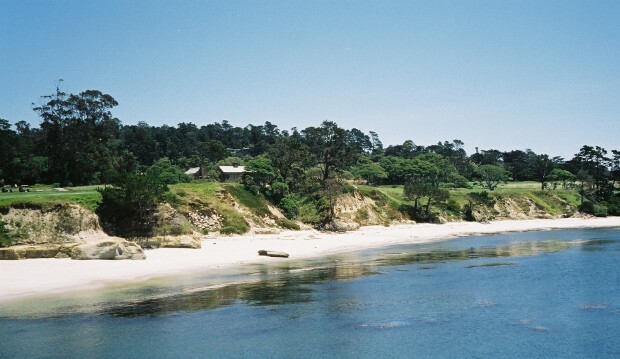 As soon as you exit you will see a toll station and the entrance to the famous 17-Mile Drive. Pay roughly $10 (it keeps going up) to traverse these hollowed grounds and follow the drive about three miles to the Beach & Tennis Club turnoff. Turn left onto Palmero Way, .24 miles turn left onto Cypress Drive, look for tall cypress tress and a narrow parking lot that is reserved for public access—just up the street from the club. Posted in California Piers and tagged with California piers, Jumbo Squid, Pebble Beach, pierfishing, saltwater fish, saltwater fishing, Stillwater Cove Pier. RSS 2.0 feed. Pier is there because of the Stillwater Yacht Club. Good work..Ken..They finally did fix the hoist in 2017..now is complete..does work all directions…would be nicer if the rules which were made in 1984 were inforced … One…Divers not to use spear guns going into the cove ..and enjoy the fish life and the beauty in the cove ….. Excellent work Ken. 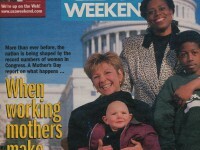 Pictures and the article… Thank You. or pull it in…..!!!! We decided not to put the boat in…Was impossible…..
$79,000 they already spend on this hoist to put the motor in ..To make the arm go out and bring it in….Did anybody looked at the hoist in Monterey?…This one is a Joke…..
To tell the truth, I really don’t know much about the boat hoist. You might contact the Stillwater Yacht Club for information regarding the hoist. It might be good to note that since this is not a “public pier”, a fishing license is required. 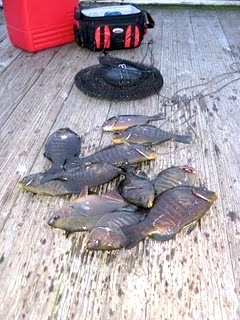 By the way, even if you don’t catch a fish you will usually catch a couple of Titliest.